The course is geared to all levels of trailering ability. It will provide the attendee with important information to be a safer, more conscientious and confident driver. Driver assistants will learn how to direct the driver to safely maneuver their trailer in an around obstacles. Topics include; trip preparation, driving do's and don'ts and how to handle emergencies. Location: Sonoma County - Riding & Driving Clubhouse at the fairgrounds, Aston Avenue Entrance gate #7. RSVP required for gate code. Each driver should bring their own trailer. We encourage that each rig have a driver and an assistant. Driver and assistant can switch roles. Location: Shone Farm, 7450 Steve Olson Ln., Forestville. Parking and scheduling details provided with RSVP. Emergency Management relies heavily upon the community members and "Volunteerism". During disasters. 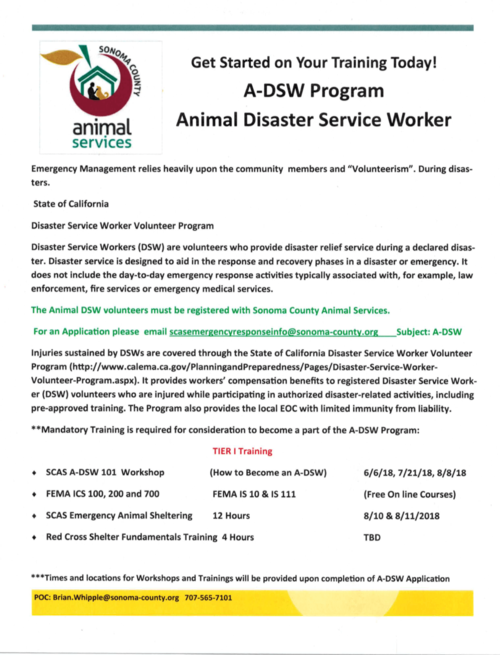 Disaster Service Workers (DSW) are volunteers who provide disaster relief service during a declared disaster. Disaster service is designed to aid in the response and recovery phases in a disaster or emergency. It does not include the day-to-day emergency response activities typically associated with, for example, law enforcement, fire services or emergency medical services. Injuries sustained by DSWs are covered through the State of California Disaster Service Worker Volunteer Program (http://www.calema.ca.gov/PlanningandPreparedness/Pages/Disaster-Service-Worker-Volunteer-Program.aspx). It provides workers' compensation benefits to registered Disaster Service Worker (DSW) volunteers who are injured while participating in authorized disaster-related activities, including pre-approved training. The Program also provides the local EOC with limited immunity from liability. officers. Sonoma County is the home of thousands of different species of animals. and devastate all planning in a matter of seconds and minutes. during these unforeseen events are needed. Registration is required to be completed by Mon April 23rd 2018. Email tstashak@sbcglobal.net for registration details. The course is geared to all levels of trailering ability. It will provide the attendee with important information to be a safer, more conscientious, and confident driver. Driver assistants will learn how to direct the driver to maneuver their trailer in and around obstacles. Driver and assistant have the option of switching roles. See event details and course outline for more information. To view the course outline, download class flyer under event details and scroll to 2nd page. Topics include: trip preparation, driving do's and don'ts, and how to handle emergencies. Location: Sanoma County Driving & Riding Club clubhouse at the fairgrounds, Aston Avenue entrance gate #7. RSVP required for gate code. Each driver should bring their own trailer. We strongly encourage that each rig has a driver and an assistant. Driver and assistant can switch roles. Meeting and presentation at 7:00 p.m.
Monday, October 30, 2017 Sonoma County Fairgrounds - Garrett Building Doors open at 5 p.m., program begins at 5:30 p.m. In response to the recent wildfires in Northern California that have impacted the agriculture community, Sonoma County Farm Bureau is convening local, state and federal leadership to address concerns and provide information to rural property owners. Key groups and resource agencies will be present to provide tailored information to the agricultural community as the rural community begins to recover. Registration is required to be completed by Tue October 10th 2017. Email tstashak@sbcglobal.net for registration details. The TTouch Method is wonderful to learn to use on horses, to build confidence, release tension, improve performance, develop trust with the horse, and interact with horses in a way they enjoy. The horses love it. It’s easy to incorporate into your everyday program with the horse and a useful hands-on tool for ever equestrian to use. In each session, you will learn new skills & useful elements of the Tellington Method step by step in a fun and supportive environment, in both bodywork and groundwork. These techniques will be presented in an easy to learn manner, with opportunities to practice and refine your technique during class. Consecutive sessions will build on your base of knowledge, and help you integrate different elements of the Method to creatively solve any performance or behavior challenges. 5:00 p.m to 9:00 p.m.
Exhibits include narratives, photos, films, apparel, tack, equipment, and fine art. 4-H, FFA, and Independent Riders. Bring your horse and a helmet if you plan to ride. No horse? No problem, this will be a learning experience for all horse enthusiasts! Riders must be accompanied by a responsible adult while at the workshop. You do not need to attend all workshops, multiple topics will be covered at each workshop. Manure must be picked up. Explore alternative approaches to listening and working with horses on an emotional and spiritual level. See attached PDF for more details and to sign up. Please feel free to share this email and information with anyone you know that would be interested. Let me know your interests and ideas for future classes. Instructions to sign up are included in the attached flyers *OR *just Email me to let me know you are coming, you can you can pay at the door. Contact me with any questions. Hope to see you all at a class or two! The course is geared to all levels of trailering ability. It will provide the attendee with important information to be a safer, more conscientious, and confident driver. Driver assistants will learn how to direct the driver to maneuver their trailer in and around obstacles. See course outline for more information. CHP officer David Juricich will attend and has kindly offered to be available for questions. Topics includeL trip preparation, driving do's and don'ts, and how to handle emergencies. Each driver should bring their own trailer. We strongly encourage that each rig has a driver and an assistant. General Meeting and Elections - 8:00 P.M.
Pot Luck Dinner - 7:15 P.M.
General Meeting - 8:00 P.M.